Great Bags!!! Very happy customer :) High quality product at an affordable price. We promote green living and use this recycled reusable bag for our store. Very durable and easy store on every shopping trip. Lightweight and very durable, also very easy to clean. We used them for a corporate conference, now my wife and I use them for kids items, the beach, laundry, amongst many other things. I would suggest this bag. Very fashionable bag, the gloss finish sets off my company's graphic logo. Long lasting, fashion forward, and high quality! Our bags look wonderful! They are so beautiful! Thanks CEP! I absolutely adore this product! Can't get better than this! We hand this bag out with any purchase during the holiday season to promote our company as well as promote green eco-friendly living. It is always a hit and huge success with all of our customers. The design we went with this year I know is going to be a success. 5-stars for this bag! I am a big supporter of "GREEN" companies and Custom Earth Promos I love and use several eco-friendly products from them. I would STRONGLY suggest to any consumer of bags, which is everyone, to use reusable recycled tote bags from Custom Earth Promos. Custom Earth promos bags are recycled and there recyclable so technically they NEVER go to waste. This is an excellent way to tell your customers you support eco-freindly green living. Highly recommend this company's bags and products. Great product. Love that these bags are water resistant and our logo looks great! Thrilled! The high gloss finish looks wonderful! These bags literally last forever. They are so strong and durable! The lamination really adds another whole level of structure and support. Really impressed with the quality of these bags. Great handle size, stitching around the bags edges is top quality. The printed image on both sides of the bag is consistent as well. I would use Custom Earth Promos again for my next bag order. nice tote bag, we have used them before. Im in advertising and we have used newspapers, magazines, commercials, radio, and other outlets to promote our brand. Just last year we ordered a large quantity of recycled reusable bags for our latest advertising campaign to try something new. And I must say the public response we got was tremendous, the bags live on and get seen over and over again. It also states the message that we care about the environment. Papers/magazines get thrown out, radio you listen and forget, but a well made reusable bag lives on. I recommend this option for any branding/company promotion. Very nice bags, my customers were very pleased with the quality and the design we came up with. Very classy shopping bags. We maintain a "going green" way, and these eco-friendly bags help us to maintain that goal. I am a general manager for a grocery store in Oregon and we use this company for our reusable recycled bags. There a good company that makes a good bag. Just received our bags and they look great. Thanks custom earth promos!! Love these bags, the royal blue color came out great with our logo. I recommend this company. They have always delivered quality service and products to me. Very cute tote that is customizable, the ladies that shop at my women's clothing store love them. Laminated Reusable Eco-Friendly Shopping Bags from Custom Earth Promos come with so many benefits that we really don't know where to start! And that’s why they’re a consistent client favorite across the hotel, spa and cosmetics industries—and beyond. 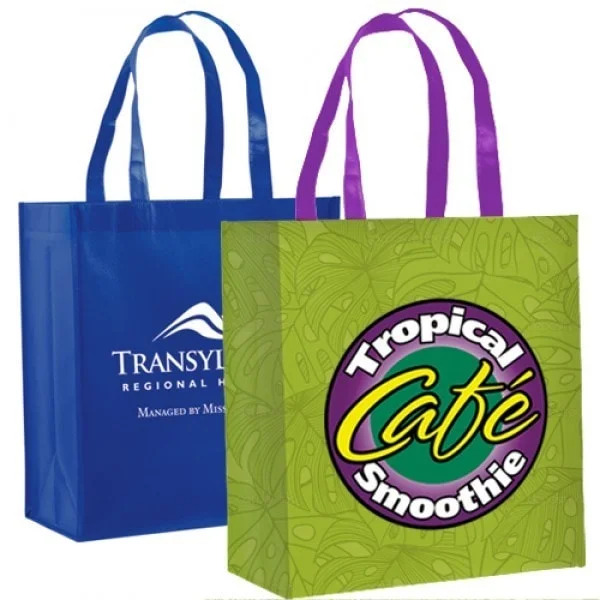 Reusable Eco-Friendly Shopping Bags from Custom Earth Promos are the popular choice of clients seeking fashion-forward, eco-chic promotional items. These stylish laminated totes also offer many useful features that have made them one of our top-selling products. You can rest assured that your marketing dollars are being well-spent when you order these bags, so customize yours today! 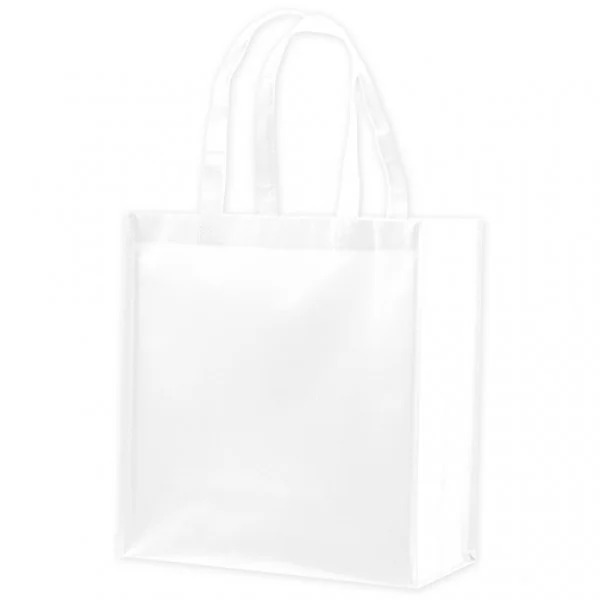 These bags are constructed using durable high-quality non-woven polypropylene, which assures high levels of reusability and toughness, lasting use and 100% recyclability. Designed to resist water, tears and UV rays, the bag's laminated surface area reinforces its structure adding strength, so it won't easily buckle, even on days when it’s lugging a heavier load than usual. With a high-gloss finish that enhances its look, the stylish Reusable Eco-Friendly Shopping Bag fits your style wherever the day takes you, giving your customers a degree of versatility they'll really appreciate. A 22" handle makes it easy to carry the bag over your shoulder or in your hands effortlessly, and it includes a bottom board insert made from recycled plastic. Plus this low-maintenance bag can be wiped clean in a matter of seconds. Our California Proposition 65-compliant bags score high in terms of safety and are 100% recyclable, so your eco-conscious customers will be able to show these bags off proudly anywhere. No clogging up landfills and taking years to biodegrade—Eco-Friendly Shopping Bags from Custom Earth Promos do their part to help support the ecosystem. When you order Reusable Eco-Friendly Shopping Bags direct overseas, you’ll get a number of custom design solutions. Add your company name, logo or other message so everyone takes notice wherever your bags go. Our talented design team ensures that the final product meets your exact specifications and expectations. So feel free to discuss the process with us. We can tweak the thickness, glossiness and lamination to suit your preferences. At Custom Earth Promos, you’ll get precisely what you order. And with our extremely competitive prices, when you rely on us for your promotional products, the highest quality and value are guaranteed.